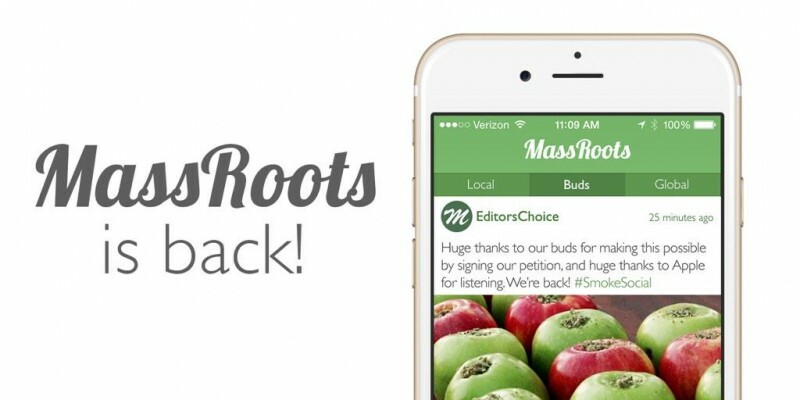 Months after Apple pulled marijuana user social app MassRoots from the App Store on November 4, 2014, the Cupertino company has reversed course and allowed the app in the App Store as long as its geo-restricted to the 23 states where marijuana is legal, MassRoots founder Isaac Dietrich told the San Francisco Chronicle. In a blog post on its website, MassRoots notes that it will be "implementing new features to strengthen our compliance even beyond what is currently required." Currently, the app requires users to login to their account to use the app. When a user registers a new account within the app, it requires location access to verify that the user is in one of the 23 states where marijuana is legal. However, users who register for a MassRoots account on its website and then log into the app do not undergo the state check, opening the possibility for users to lie about which state they're residing in. Update: MassRoots founder Isaac Dietrich has contacted MacRumors, telling us the company is working on a hard geofence for both its website and Android version of its app. It should be live tomorrow. The Chronicle notes that MassRoots is one of a dozen marijuana-related companies to see their social media apps pulled from the App Store. While MassRoots was able to reach a deal with the Cupertino company, the others are still in discussions. Marijuana is the scourge of the West. When are people going to wake up to the fact that they have been indoctrinated into a Cult of Weed? Marijuana dumbs down the masses. Ignorance is far more of a scourge. .... Now just allow it in the other states, and stop knowing what's best for everybody. I don't get it. There is nothing illegal about a marijuana app, even in the 27 states where it's not legal for any purpose. They still sell High Times magazine in Barnes and Noble all over the country, what's the difference? Why is Apple taking it upon themselves to demand the app be geofenced? It is legal over your side of the pond in some places? Here in the UK it really is not, although that doesn't seem to stop people - especially those from deprived neighbourhoods - using by it all the time on the street. Horrible to.walk past. The difference is that rich people do it in their own homes. Point 1. They should make weed illegal everywhere in the US. The obesity problem is real and we need to do everything possible to reduce it. Are you high? What a ridiculous comment. Americans didn't get fat because some of them smoke weed and like to scarf down Cheetos. I am sorry, but anyone who chooses to smoke weed is an idiot. Point 2. I wonder if Apple is concerned about getting sued in states where weed is illegal. I can imagine a situation where someone uses an app to cross the border and score weed, bringing it back to their state. they get arrested confesses that they used the app, and blam, lawsuite against Apple. i am not a lawyer, but given the way things work in this country, I see a scenario where the person was high and was in accident, which leads an amulance chasing lawyer to sue Apple for allowing the app, which somehow is responsible for the accident. Why don't we ban alcohol while we're about it.